Bosu Balance Trainer and Terra-Core Balance Pads are used in rehabilitation, fitness and athletic agility programs. 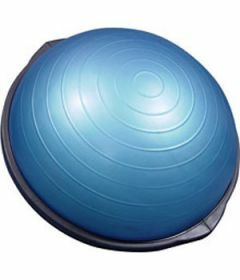 Commonly referred to as the "Bosu Ball", these balances devices can be used for similar balance exercises and workouts performed on exercise balls. Balance, stability and proprioception equipment is widely used in physical therapy, rehab and fitness to promote balance and engage muscles. Other similar balance products include the Airex Balance Pads and Beam, the Theraband Stability Trainer and many sizes and shapes of foam rollers.